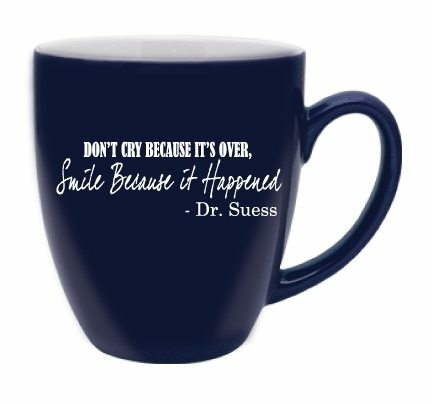 Ceramic Coffee MUG-15-0006 – Don’t cry because it’s over. Smile because it happened. Get your caffeine fix in style with a Magnetic Messages ceramic quote mug. They are perfect for coffee, tea, hot chocolate, soup and more. Our mugs will complement many table settings and kitchen counters. 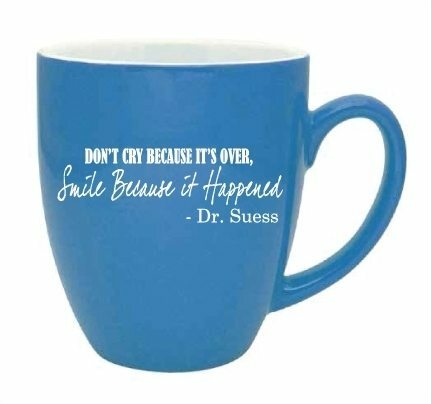 At home or the office, these 16oz mugs are dynamic and rich in color and the great life quotes fit your every mood. Furthermore, our mugs are the perfect gift for all of your holiday needs. 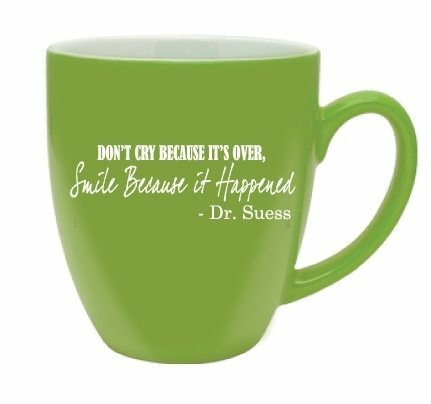 Each Magnetic Quote Mug comes in Tiffany Blue, Sea Foam Green or Royal Blue. Also, all mugs are microwave safe, dishwasher safe and chip and crack resistant. With its large easy-to-grip handle, steady base, and hefty 16 oz. capacity, this mug allows for comfortable sipping and slosh-free use for every day. Magnetic Messages Coffee mug designs are professionally printed. Make someone smile with funny, inspirational and great quotes by renowned authors. We also have some great quotes by your favorite Disney characters which are sure to brighten anyone’s day. Each of our mugs meets or exceeds FDA requirements for food and beverage safety.